Madhusmita Basu Ray Chaudhuri from Calcutta, B.Sc Graduate. Madhusmita Basu Ray Chaudhuri is Business Straregy and currently have no work experience. MS OFFICE MS EXCEL MS POWERPOINT AND WO.. R PROGRAMMING VBA SPSS BASIC KNOWLEDGE.. SAS C ..
are one of expert skill area's of Madhusmita Basu Ray Chaudhuri . 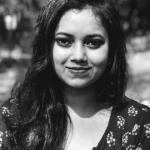 Madhusmita Basu Ray Chaudhuri is working in Corporate Planning/Consulting/Strategy industry.